In counterpoint to Andrew Hall’s now 12-year-old annual review of Mormon Literature[fn1] (the first part of the latest edition appeared last week), I thought it might give some perspective to look at what Mormon Literature looked like 100 years ago. Boy have we come a long way!! Unfortunately, I was only able to look at the books published in 1912, not items in periodicals, because the periodicals aren’t available online, except for a few cases[fn2]. The periodicals also require significantly more work to pull out the literary items. I hope to get through many of the periodicals sometime this year — and if I do this again next year, I’ll try to include periodicals from the start. I’m late in saying this, but it still should be said: if you haven’t already, I’d recommend reading Randy Astle’s presentation from the November 2010 Mormon Media Studies symposium. What Randy does is take a look at the major schools of film criticism and then propose the method he thinks is most amenable to a Mormon worldview *and* that a Mormon worldview can enrich as a theory of how film operates. I don’t want to discourage readers from clicking through to his presentation so I won’t reveal what that is, but I will quote what he has to say about the importance of criticism. Spencer W. Kimball’s “The Gospel Vision of the Arts” is admittedly ubiquitous in discussions of Mormon art and media, and it is usually cited for his predictions of remarkable future accomplishments, for instance that Mormon-themed “masterpieces should run for months in every movie theater, cover every part of the globe in the tongue of the people, written by great artists, purified by the best critics.” But while LDS filmmakers, in this case, have reason to rejoice in this prophetic benediction, it is my firm belief that the most important point is the final one, that the best critics must purify our films and, by extension, other media. Mahonri Stewart: Of Prophets and Artists: A Household of Faith Or A House Divided? William Morris: Damn you Norman Manea! Feel free to get all nostalgic and hagiographic in the comments. To peruse our archives by date or category, click on the drop down menus over there on the left. Or to see what each contributor has written, click on Contributors and the “posts” link next to his or her name. Mormon films: walking a fine line — A report on a panel discussion at the festival moderated by AMV’s own Katherine Morris. Award-winner altering movie scene with uplifting films — a profile of director and producer Rick Stevenson. More Mormon Times coverage here. Most Mormon books, music and film are like little fish in a pond. Fortunately, consumers of these Mormon products face the same situation. I think the idea behind the metaphor of fish in little or big ponds is something students face as they approach graduation and start trying to find some kind of success in the world. Students have to decide what kind of success they are aiming for: do they want to be big fish in a little pond? or little fish in a big pond? Are they content to be important in a small company or a cog in a large company? So how does this all work with Mormon products? Are Mormon products trying to find their audience in a small pond or a big pond? 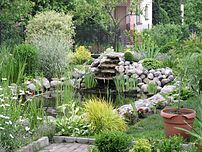 Should I move between ponds? And is it possible to be available in both small and big ponds?